President Moon Jae-in‘s naming of six new vice minister-level officials on Sunday has added fuel to speculation that a Cabinet reshuffle could occur as early as this week. On Sunday, Moon named Min Won-ki as vice minister of science, Park Chun-kyoo as vice environment minister and Kim Yang-soo as vice minister at the Ministry of Oceans and Fisheries. Moon also named Kang Shin-wook as the new head of Statistics Korea, Kim Jong-seok as the head of the Korea Meteorological Administration and Park Je-guk to head the Appeals Commission. 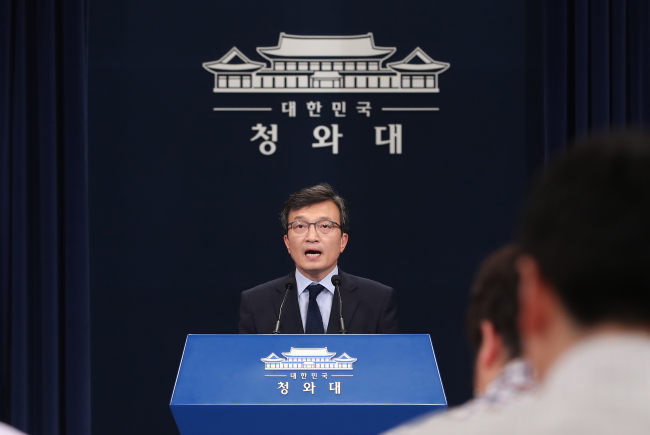 After announcing the vice minister-level appointments, Cheong Wa Dae spokesman Kim Eui-kyeom denied the announcement had any connection to a minister-level reshuffle. Kim said the organizations concerned in Sunday’s announcement will not necessarily see change of leadership, and the appointments are part of usual government affairs. According to Kim, the vice minister-level officials had served between 14 to 15 months on average in past administrations, and further changes will be made as the Moon administration rolls out its first vice-ministerial reshuffle. While Cheong Wa Dae declined to comment on the timing of the Cabinet reshuffle, a number of minister-level officials have been linked to a reshuffle. According to reports, Minister of National Defense Song Young-moo and Minister of Education Kim Sang-gon are among those likely to be replaced. Song has been at the center of numerous controversies since taking office, including those surrounding allegations the Defense Security Command drew up operational plans to declare martial law. As for Kim Sang-gon, the attempt to revise the country’s university entrance system conducted under his watch has been branded a failure.